On the third consecutive day, we enjoyed the Pyramids from our hotel window. As We have to catch the flight on the last day eve itself. So with good sense, we checked-out from the hotel in the morning itself. 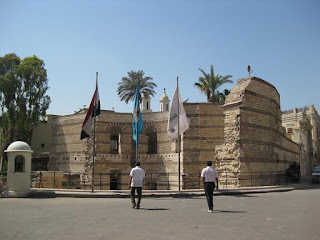 We started our tour with the entry into Coptic Cairo city area. 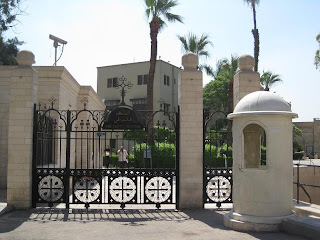 We have a chance to quick visit to Babylon Fortress, the Coptic Museum, the Hanging Church, the Greek Church of St. George and many other Coptic churches and historical sites in this area. 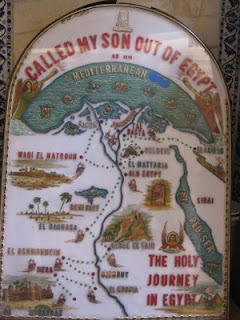 Coptic museum holds the largest collection of Egyptian Christian artifacts in the world. 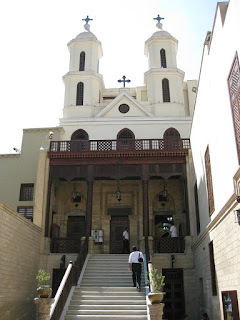 The Hanging church (Saint Virgin Mary's Coptic Orthodox Church) is one of the oldest church in Egypt. It is named due to its location above a gatehouse of Babylon Fortress. 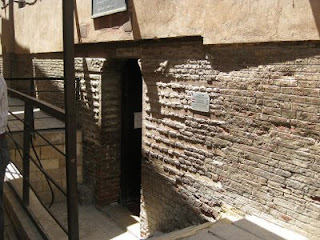 It can be seen from a place inside the church. 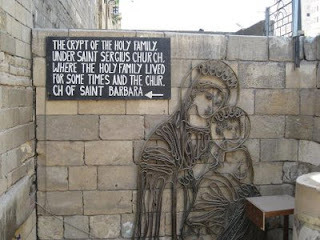 It is believed that the Holy Family (Child Jesus, Virgin Mary, and Saint Joseph) visited this area and stayed at the site of Saints Sergius and Bacchus Church (Abu Serga). 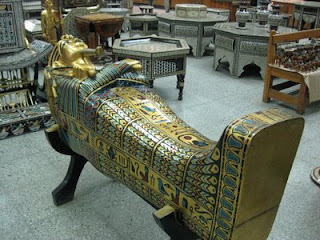 Later on we visited the nearby market for some Egypt key-rings, souvenirs and other stuff. Then we progressed towards the grand Cairo Citadel (The Saladin Citadel of Cairo), another most popular tourist destination. But still we have some time left to spare. From here our driver and guide move us towards the Muqattam hill for a spectacular view of Cairo as the bonus place. If you have open eyes, you can have panoramic view to the stretched city with some sky crappers, along with great Pyramids and the Nile river in your coverage. The views from the hill were spectacular. 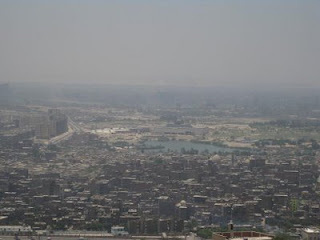 Being the afternoon, and city being polluted and dusty day, The pyramids may not be pretty visible in the photographs. Now its time to back to Cairo International airport. While returning we saw a pyramid-shaped monument in Nasr City, Cairo. This is known as "Unknown Soldier Memorial". This was just near the Cairo International Stadium. Finally we fly back to Larnaca (Cyprus) within our booked bird. We enjoyed the best of Egypt within 3 days as much as possible. It couldn't be better than this. The whole trip will remain like a unforgettable tour for all of us. Thanks to Ayu who insisted me to visit it.